This time I intended to take it easy on myself but got into a bit of a bind anyway. Right now my house has floor-to-ceiling bookshelves that act as a divider between the kitchen and the family room where the fireplace resides. My intention in remodeling is to open this entire area up and tie it together into a single room. Problem is that the existing shelves had accrued a certain amount of "junque" that needed to be moved first. Thus, this bookcase. My intent was not to make a pseudo-Shaker piece so I just winged it while I did the mental design. As it turned out the finished shelves bear an uncanny resemblance to some creamery shelves from the Mt. Lebanon community. This was not intentional but after looking at so much Shaker furniture for several years the images and stylistic features must be well fixed in my mind. In my own defense, the daft joinery is entirely my own idea. The joinery is by thirty (yes 30!) through wedged-mortise-and-tenon joints. This seemed to be a good idea before construction started since I didn't want a back on the case and this lack would compromise the rigidity of the structure unless some extreme measures were taken. 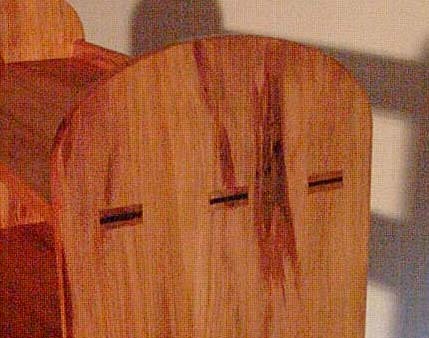 Had I realized how much trouble the mortises would be I would have reconsidered. Even though a router was used to waste out most of the wood, there was a massive amount of chisel time spent on the joints. As luck would have it, the little corner chisel I had on order showed up two days after the last mortise was chopped. The real panic came about when glueup time came. Getting the entire piece together and into clamps before even slow polyuretane glue set was a real problem but I did manage to get the last of the wedges driven home before the time limit. The foaming of the glue caused some problems in cleanup but I probably would have never managed if I had used regular PVA glue since it sets faster and would have made the already-tight joints entirely too grabby. The spacing between the shelves is graduated from 12 to 9 inches. Across the back of each shelf there is a 1-inch rounded lip to prevent books from dropping out. The tenons are 1¼ wide and ⅝ high giving a slight shoulder on the inside. 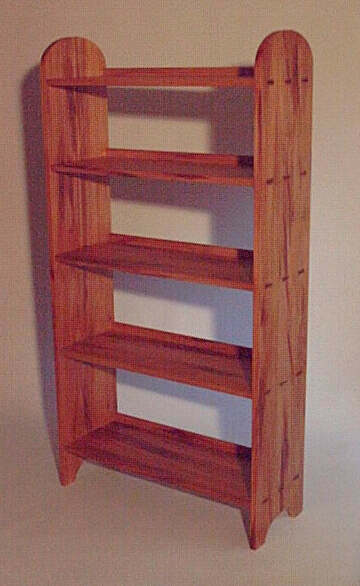 The finish is boiled linseed oil with garnet shellac padded over it. The material is all wormy sycamore with the exception of "Queensland walnut" wedges. Overall size in inches: 59½ X 29 X 11.